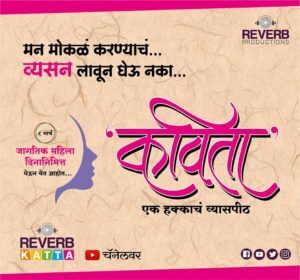 Reverb Katta is a youthful YouTube Marathi entertainment channel for all kinds of audience. It has the energy yet the elegance which is surely giving it the maximum number of subscribers and a huge success. Their new platform Kavita is something to watch and talk about. Any project is better understood when it’s explained by the producer; because he is the one who sees the potential in it before anyone else. So we decided to understand Reverb Katta and Kavita better with their producer Mr. Abhijit Kolhatkar who is as youthful as a youngster yet experienced. Let’s see what is Reverb Katta through his eyes. MarathiCelebs : Hello and welcome to MarathiCelebs.Com. Tell us, what is Reverb Katta ? Abhijit Kolhatkar : Hello ! Reverb Katta is an entertainment YouTube channel for Marathi audience who can reach to us from anywhere with this channel. It’s an internet based entertainment channel. Our primary focus is high quality Marathi entertainment. Though it’s our focus yet we are open to all genres and we believe in giving fresh and different content to our viewers. As we know if you want to watch something on television you have to watch it in a linear format whenever it will be telecasted whereas on internet you have the power to watch your desired content anytime, anywhere and on any device. We try to develop and provide such content that can engage all kinds of audience, all age groups; so that no one gets bored and it’s easily relatable to everyone. MarathiCelebs : As a producer why did you choose digital platform ? Abhijit Kolhatkar : As I said above I think it’s a new age media and it has its power and impact on audience because of its pros. Reverb Katta is a youthful channel and you can see that not much of youth is really interested in watching television. They prefer web series or web content because it’s convenient and easily available as per their desire. I believe in next few years internet will be the leading entertainment medium other than anything else. MarathiCelebs : Tell us something about your current project Kavita. 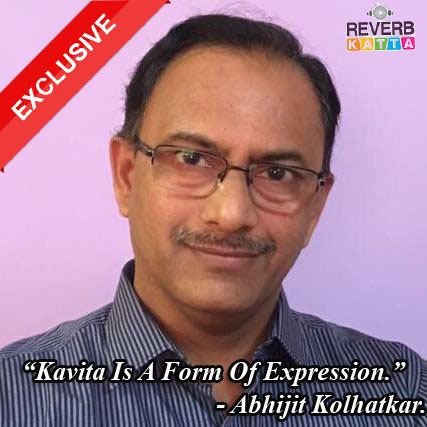 Abhijit Kolhatkar : Kavita is our new platform which is for aspiring poets. If you look at few years back if you wished to publish your poetry book then you had to write at least hundred poetries which mean minimum hundred pages. Now it’s not always possible and it doesn’t get that much exposure as well. Here we tried to create such a platform where you can publish even ten poetries in a book format and also in audio visual format which is available across the globe for anyone to watch. It’s on internet so it has the maximum possible reach for these poets. Plus it’s pocket friendly. We provide right from counseling about the poetries to the publishing of it and it’s an open platform for everyone. Whoever is interested can reach to us easily. MarathiCelebs : That’s a good initiative. What do you think is the most appealing thing about Kavita ? Abhijit Kolhatkar : Well we all are humans. We need to express ourselves. Do you know why Facebook was invented? It was invented out of the need of expression. On social media people express themselves. We exactly thought about it and decided to give a platform to these poets to express themselves in the form of their creativity. People are getting to know about Kavita. I guess this is the best thing about Kavita. What is a better feeling than expressing yourself in your words ? The concept clicked me and I believed that people will also like it. 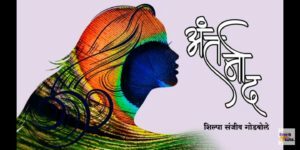 MarathiCelebs : First as a producer and now you are playing a role of the director for Kavita; how has been the experience of all this? Abhijit Kolhatkar : It’s wonderful. I have worked in an IT field before for many years. So I am well aware about these mediums and I have knowledge about those which helped me a lot growing Reverb Katta. Also as we all know entertainment is itself evolving over a period of time and it will be like this. So it’s a constant learning experience and one of a kind. MarathiCelebs : Reverb Katta always comes up with new concepts; what do you think inspires you to always provide such unique content ? Abhijit Kolhatkar : We are primarily driven by passion. Entertainment industry is very vast and inspiring. We believe that people should get quality and relatable content. Whatever we are showing should be worth of people’s time and attention. There are different kinds of people, different age groups, urban people, metropolitan cities or anything you name is diverse than the other. We basically try to reach out to all these through our content, through our shows. Because each one of these faces different problems and has different tastes. MarathiCelebs : Do you plan on telecasting this content anywhere else other than web ? Abhijit Kolhatkar : Well there is a huge audience group which is not watching television today. We will not be creating any content specifically for television or any other platform but yes we are open to license the makers who are ready to recreate this content. There are many people who are not on YouTube or not connected to Reverb Katta. With us being open and welcoming to the idea even such audience can enjoy this content. Our basic motto is to deliver high quality content to everyone. Whether it be anyone. I would also add one thing for the companies. They are not yet seeing internet as a potential advertising market but in my opinion it has the very vast market and reachable to maximum people. So I feel it would be great if they will start investing in it. Thank you so much Mr. Abhijit Kolhatkar for talking to MarathiCelebs.Com. We wish you and Reverb Katta team all the luck for future endeavor. Marathi Actor, Marathi Celebs, Marathi Actors, Marathi Celebrities, Marathi Actors Wallpapers, HD Wallpaper, Marathi Entertainment Industry, M town, Celebrities, Directors, Producers, Marathi Directors, Marathi Producers, Lyricist, Screenwriter, Cast and Crew, Cast & Crew, Marathi Movies, Films, Songs, Marathi Serials, Teasers, Trailors, Trailers, Selfie Video, video profiles, Celebs Katta, MarathiCelebs.Com, Marathi Website, Film Reviews, Articles, Videos, Marathi Actresses, Marathi Actors Biography, Marathi Actresses Images, Pics, Upcoming films, Upcoming Serials, TV Updates, Film Industry, Photos, Promotions, Interviews, New Films, Selfie Interview, News, Trailers, Zee marathi, zee yuva, star pravah, zee talkies, New Release, Blockbuster, Hit Films, Reverb Katta, Abhijit Kolhatkar, Shilpa Godbole, Kavita, Antarnad, Antarnaad, Reverb Katta Launches New Platform For Aspiring Poets, Web Series, Moving Out, Twist Eat, Night Out, Poetry Publishing Made Easy By Reverb Katta, Diary, Abhijeet Nag, Antarnad – The Voice Within, Antarnaad – The Voice Within, ‘Antarnaad’ | Reverb Katta’s First Poetry Series, Antar, Me Ashich Aahe, Womanhood Celebration With Reverb Katta’s Kavita, Tarihi Kalat Nahi, Tu Waar Karat Raha, Waar, War, Vaar, Var, Najret tujhya, Najret Jaadu, Najret Jadoo, Kadhitari Vatata, Aapan Saglya Ashach Asto, Kavita Is A Platform For Expression | Abhijit Kolhatkar Exclusive Interview, etc.